Environment - MMA - MAISON - MODULAIRE AUTONOME - Inc.
​We also want to innovate in the field of the environment by incorporating new technologies such as photovoltaic and thermal panels, rainwater and wastewater recovery systems, filtered by a new process (reverse osmosis) and Recovery of waste. Our goal is to produce green buildings that respect the environment while reducing the carbon footprint associated with their construction. ​You want natural, environmentally friendly and economical electricity? Think of photovoltaic panels: reliable and easy to maintain, you will love to save energy! The photovoltaic panels will produce electricity all year round, even in winter and a photovoltaic panel installer will be able to offer you a profitability study with the performance of your future panels ! 3 components making up the photovoltaic panels These 3 elements transform the light into alternating current. Their different layers allow the appearance of a potential difference, and thus of a voltage between the two faces of the cell, as for a battery. The use of photovoltaic panels, consisting of photovoltaic cells, aims to convert light energy into electrical energy. To obtain the best quality / price / service ratio it is essential to compare the prices that will offer the installers of photovoltaic panels for your future installation. Please note that the amortization of your investment will depend on the total cost of the operation, the tax credits and the state and regional aid to which you will be entitled (your photovoltaic panel installer will also inform you about these points And will take steps for you) and the electricity production of the panels over the total duration of your operation. Investing in a green and economical mode of production of electricity such as photovoltaics is a first step towards sustainable development and the reduction of bills. To make your installation even more efficient, take a few simple gestures on a daily basis. Producing your own electricity, in an environmentally friendly manner, or even obtaining a certain income, is possible thanks to micro-wind power. With this system, you gain autonomy and reduce your ecological impact on the planet. A micro-wind turbine, otherwise known as "wind turbine for private", "domestic wind turbine" or "mini-wind turbine," produces electricity using wind force. It is a totally ecological method of producing electricity. The micro-wind turbine produces no atmospheric discharge, since its operation generates neither gas nor smoke. It uses no fluid, no combustion, no chemical to produce electricity. The energy used is free, green par excellence and 100% renewable : the wind. Some consider that a domestic wind turbine is a source of visual and sound pollution. The noise pollution is very real since a micro-wind turbine emits noise while operating. But in reality, this inconvenience is very minimal because a domestic wind turbine in good condition is very little audible: 40 dB. Professionals and installers generally compare this level to that of wind in trees, or to that of a modern refrigerator. In most cases, estimates of coverage of electrical requirements do not take into account heating, which nevertheless represents a significant part of this item. Look carefully for the words "without heating". If it is not mentioned, think about getting this point clarified. If you live in an isolated electrification zone, the micro-wind turbine can provide you with an electric autonomy allowing you to do without a noisy, polluting and expensive gasoline generator. By combining your domestic wind turbine with a photovoltaic system, you can cover all your daily electrical needs and thus be completely autonomous, thanks to green energies. Each Quebecer consumes more than 400 liters of water each day. We use potable water for many uses for which it is not necessary. Indeed, less than 1% of domestic treated water is used for consumption. A second inexpensive option would be to use the excess rainwater for flushing toilets, allowing another substantial saving of up to 30% compared to typical consumption. So, at the price of a rather bulky tank and some additional plumbing, it would be possible to reduce our consumption by 60%, without it costing the eyes of the head! Moreover, it is possible to make yourself a rudimentary rainwater recuperator for a few dollars, at most. Under the heading "gray water" or "waste water", all sources of contaminated domestic water are excluded, excluding toilet flushing. The term may therefore include drained water from washbasins, shower and washing machine (generally not the water coming from the kitchen sink, or the dishwasher, containing grease and organic matter). These sources can represent more than 150 liters of water per person per day for an average Quebec city dweller. That is to say that more than 600 liters of gray water per day-220,000 liters per year. The distribution of water consumption in a residence. 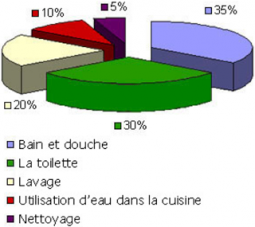 In this figure, the gray water consists of all these sources, apart from the toilet. We note that the water coming from the bath and the showers corresponds to the total water demand for toilet flushing !